More in Heaven and Earth: The Refugee Crisis and the Holocaust - How not to learn the lessons of History. The Refugee Crisis and the Holocaust - How not to learn the lessons of History. I am a big fan of learning the lessons of History. Without understanding the past our understanding of the present will always risk being superficial. However, amid the chaos and confusion that has been exploding across Europe due to the refugee crisis some people have not got the idea quite right. The problem comes when people pick out entirely superficial resemblances to historic tragedies when much larger problems are raging around. Hundreds of thousands of migrants are struggling across the continent, and there is massive confusion among official bodies in about what they were meant to do with the tide of people. The BBC reports in one Czech town migrants "had numbers written on their skin with felt-tip pen". The police thought the "priority in dealing with the 200 migrants at Breclav railway station [...] was identifying them and trying to keep family members together. This was a difficult task when many had no documents and did not speak English; hence the numbers in felt-tip pen on their arms." But many news outlets were outraged because somebody felt this vaguely visually resembled something that was done during the Holocaust: the tattooing of prisoners at Auschwitz, the largest Concentration/Death camp. This is one of the most trivial historical comparisons I've ever seen. 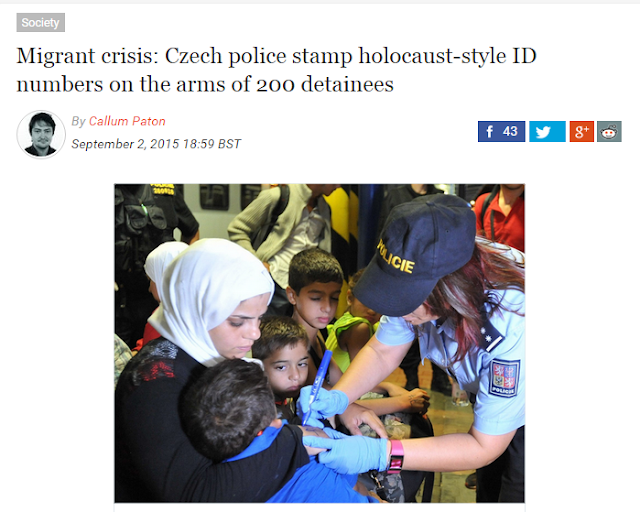 The Czech authorities were faced with a situation that was crowded, noisy, confused, dealing with large numbers of people with no ID papers and with whom they probably didn't share a language: whether Czech, English or Syrian Arabic, and so they resorted to felt tip pen. And no, they didn't "stamp" it, they wrote it. The difference is quite clear. Of all the things that are a problem with the refugee crisis, the EU response (and even the Czech response) this is really not one of them. Even on a surface level the resemblance is not that close. Auschwitz prisoners were tattooed on the arm or chest and some of these tattoos are still visible on survivors 70 years later. The refugees had a number written on their hand in felt tip, which they could rub or wash off in a few minutes. It's hard to know where to start with the other important differences between the planned mass murder of millions of people and a temporary measure to organise a small group of migrants in a Czech train station. It feels like no-one should need to say that but apparently we do. Seemingly news outlets would rather officials cared less about what they were doing to help people, and care more about whether their actions bore a totally superficial resemblance to tiny parts of a vast historic crime. This summer was very hot in Poland, reaching 100F (or 38C) and so the Auschwitz memorial museum set up mist sprays to cool visitors cueing for long periods in direct sunshine. Apparently though, this caused complaints that they resembled the gas chambers used to kill hundreds of thousands of people there. Actually, I say complaints, but every article I've seen on this repeats exactly the same complaint from one tourist. Again, though, that same article has then been copied and pasted into many online news outlets until it popped up on my computer. It's hard to know where to even start. Firstly, the museum had an entirely legitimate health and safety reason for putting the mist showers up. 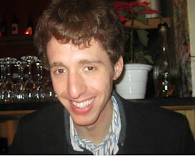 Secondly, again, the resemblance is entirely superficial and frankly vague. I can do no better than quote the Auschwitz museum trust's own words from their Facebook page, in which they sound frankly bemused by the whole thing. "And one more thing. 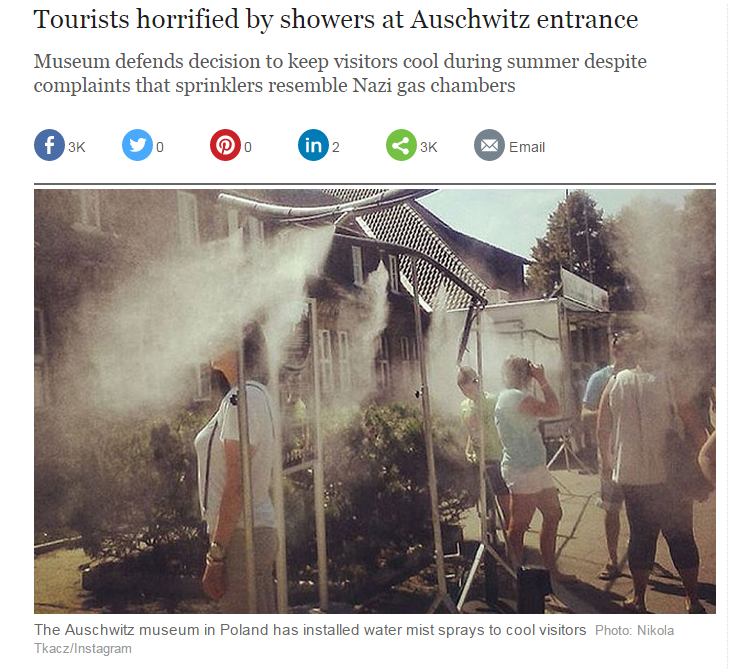 It is really hard for us to comment on some suggested historical references since the mist sprinkles do not look like showers and the fake showers installed by Germans inside some of the gas chambers were not used to deliver gas into them." That means that some of the gas chambers were disguised as shower blocks to avoid panic and resistance among the victims and to encourage them to strip before being murdered. The shower-heads in the blocks were never used though. Anyway, how anyone could confuse an old fashioned concrete building with fake shower-heads inside with an outdoor mist sprinkler is beyond me. Also, I can't help but feel the complaint is bizarre because surely you're meant to feel uncomfortable when visiting Auschwitz? You're meant to be reminded of the gas chambers? It is unclear whether the person thought the idea of people not being too hot was insulting to victims, or was too light-hearted or what. 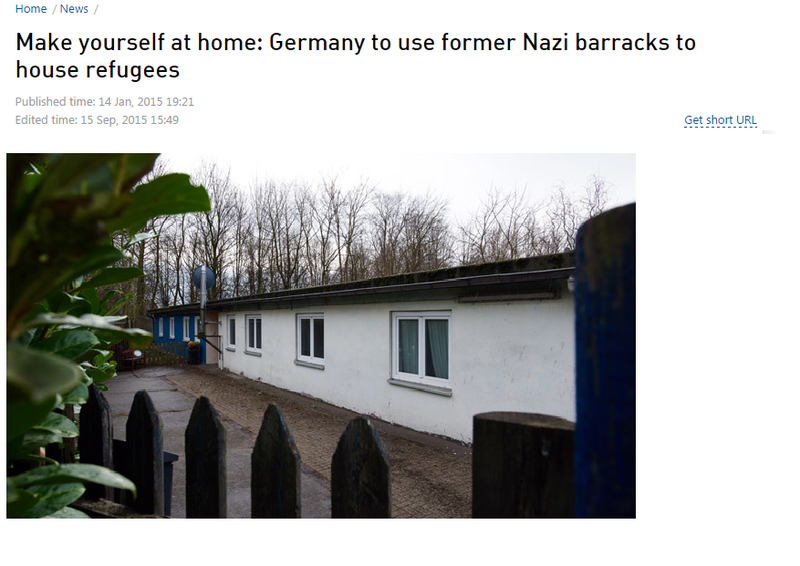 "Officials in the German town of Schwerte have made plans to place some 20 refugees in barracks which were once part of the infamous Buchenwald concentration camp. The 'pragmatic solution' to provide shelter has sparked criticism, German media reported." The wave of refugees entering Germany this summer has strained local resources and available accommodation. So one town has decided to use vacant buildings that were once barracks for guards of a sub-camp of Buchenwald, one of the Nazi concentration camps. This genuine attempt to help in a time of major demand and limited resources is apparently not good enough for some people. "the decision has sparked criticism among the country's activist groups, with many calling the plan "questionable" and "insensitive." It's not clear who it is insensitive to: not the migrants who will have somewhere decent to stay, not the victims of the camp who almost certainly couldn't care less even if they knew. And as for 'questionable', that has to be the weakest criticism known to man, to be reached for by politicians and activists when they have nothing to actually say. I would hope that almost everything is 'questionable', except perhaps the fact the sky is blue (and even then one may ask, why). The activists do not seem to be making any alternative suggestion of where the refugees should be housed. And I shudder to think what they would have said when for years after 1945 many of the camps were used to house the millions of refugees and displaced persons who flooded Europe at that time, in some places for years afterwards. In times of great need you do what you can with limited resources to help people. And finally my last Holocaust related example of people missing a major issue and clinging on to the completely superficial and irrelevant. Migrants and asylum seekers are commonly kept in camps for periods of time while they are being processed, especially when large numbers appear at once. And particularly in this current crisis large numbers have been travelling by train across Europe. 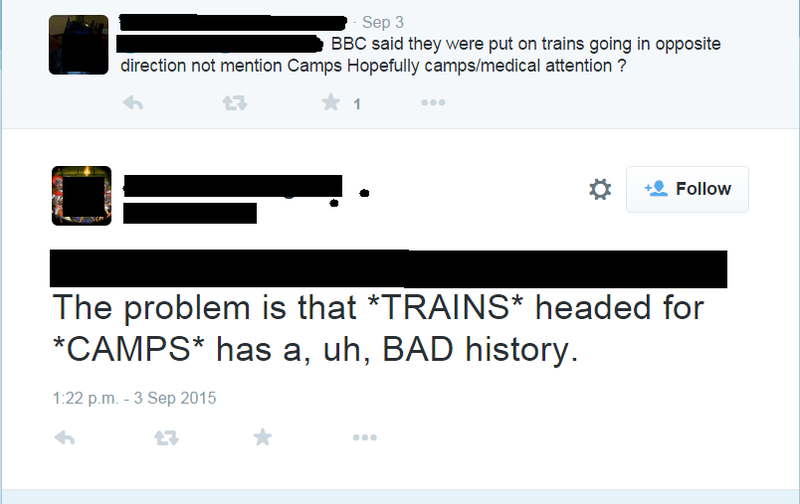 Which will be sad news for anyone who has ever taken the train to Butlins, or Centre Parcs, or a festival of any kind. Now, it shouldn't need to be said, but to avoid confusion, I'm not saying that the European response to the refugee crisis has been perfect. But I am saying of all the things wrong with it this isn't one. It's like people's minds are just trying to cling onto something, anything, so they latch onto the surface level visual resemblance to something terrible that once happened. Maybe I'm over-reacting to a few daft news articles and twitter comments. But I saw all these examples within literally a couple of days, and I wasn't going looking for them. For a brief period it seemed like we were entirely losing our critical faculties. Hopefully it was just a one-off fluke of social media. But most people spend understandably little time in their day thinking about complex global problems. This kind of total trivia just chews up that valuable time and distracts people from actually considering what is really important about these crises, and makes them think these are the kind of issues that they should be concentrating on. The whole model of 24 hour online news media is partly to blame. We have actually reached a point where there is too much 'commentary' . There are so many news sites that have to be constantly filled with a stream of 'articles' that it just encourages sites to put up any old rubbish with a title that might get a few clicks. It's staggeringly lazy. Each of these 'stories' could be found pretty much word for word identical on many, dozens, scores, perhaps hundreds even of different online news 'platforms', presumably just copied and pasted from Reuters or Associated Press or whoever actually originally wrote the piece. There's no creativity or intelligence or effort involved whatsoever, and once you become aware it's incredible how much of even respectable newspapers and media channel's content is just lazily copied and pasted in this way without any thought of the quality of the 'story'. Even when it's not just copied and pasted from somewhere else the need to constantly update with new content leads to attempts to generate stories left, right and centre where frankly none exist. More generally, some in our society seem to think you show what a good person you are by finding things that nobody else has thought to be outraged by and getting really angry and pissed off about them. And the more obscure the thing is you've found to get outraged about the better. That just shows you care more than the other people who haven't noticed that offence or 'insensitivity' enough to be screaming into their computer screens. Any idea that taking a pompous position of personal moral superiority is itself bad, or that people might make innocent mistakes that deserve some benefit of the doubt, or might just be doing the best they can in difficult circumstances, seems to be get lost. I imagine the format of many online media, whether short blogs, twitter, facebook, tumblr or whatever, adds to this: difficult to present a nuanced view that understands both sides, easy to scream outrage and bile. Neither do I think this helps get more good done. Often it just makes the world an angrier, shoutier place and distracts people from doing any good, rather than attempting to appear good. As well as quite possibly making us all more miserable and stressed, apart from that small number who seem to actively enjoy having someone to yell at. I understand the irony of criticising people for criticising people over trivial issues instead of focussing on what's important when this itself is not exactly vastly important. And I am sorry for that, we are all trapped in the same hell. In fact, I don't want to criticise any individuals in particular because there's no point. I just want to encourage greater consideration about what really are the serious issues, common sense, and the occasional benefit of the doubt. That would make the world a less angry place while actually seeing more genuine understanding of complicated historical issues, and more good done in the long-term. When there is genuine, serious injustice and suffering, people need to raise a voice, even an angry voice. But we would be better able to hear that voice if it wasn't drowned out by a constant, screeching tidal wave of trivialities. Massive agreement on one of the key points - 24 hour media. Nowadays there are literally tens of channels that churn out news 24 hours per day. Every day. And thousands of websites that churn out news all year round. It is *necessary* to have something to fill all that time, however important / meaningful that thing may be. We end up with way more junk hitting our senses. The consequence is obvious - fill that space with quasi news. How can Yahoo's "Video of dog that looks like an alien goes viral" ever be considered news? The fact that pre-yahoo mentioning it, there were only 200 views is beside the point. Post yahoo, it will have 100's of thousands of views. It is total trash. It may be entertaining, it may be quirky, and it may show something odd / funny about certain behaviours. But it is not news.